I found this website when I was looking for ingredients in Tide Laundry Detergent since they don't publish them on their container. 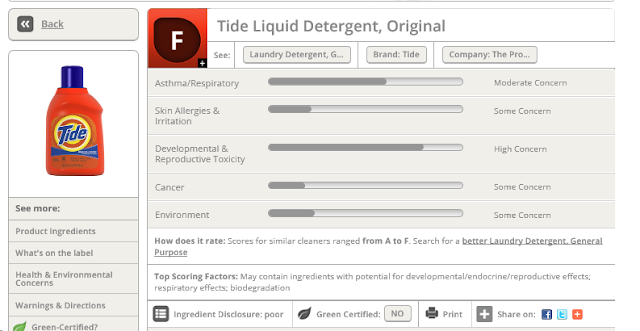 Tide received an "F" for toxicity and potential health concerns which is not surprising considering they hide their ingredient list. Highly recommend using this site to find products that are environmentally safe and healthy to use around the house. advance sound science in environmental health. Our original research and skilled use of technology make complex issues personal and urgent. We put the power of information in the hands of the consumer, influence markets to support cleaner, greener products and work to reform the law to better protect human health. EWG’s strategic goals are to inspire, empower and unite Americans to live healthier, greener lives while protecting public health and the environment for generations to come. Our partnership with Healthy Child Healthy World ensures that children’s health is at the core of all our programmatic work. We will continue to grow our capabilities and deepen and broaden our reach. Our aggressive growth plan will allow us to invest in new staff and resources while staying nimble and relevant in the ever-changing political, social and technological landscape.